The castle at Bentheim: an essay of random thoughts on landscape, history and money, modernity and nostalgia in the Dutch Golden Age. Look at this. Don’t by the way try reading this piece on a phone. Wait until you have access to a proper screen. Then look at this. 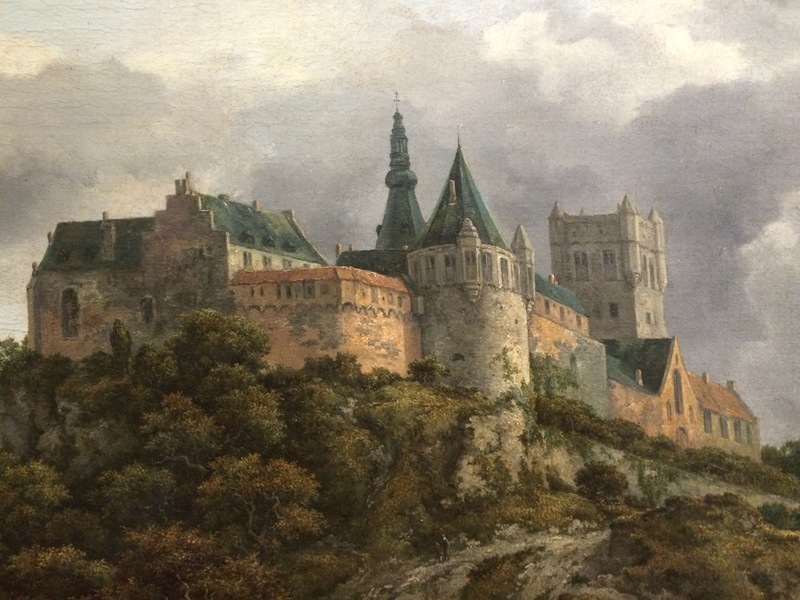 It’s a detail of a work titled Castle at Bentheim, by Jacob van Ruisdael. This painting is often thought to be his masterpiece, we’re lucky to have it in Dublin at the National Gallery of Ireland. I’m there 4 or 5 times a month and I find myself drawn to it, again and again. Van Ruisdael was of course a landscape painter from Holland’s Golden Age, in the 17th century, when most painters were “genre artists”. That’s to say, specialists in one type of painting and the skills each of these genre subjects required. The particular skill in the depiction of clouds say, the sea, or a bunch of grapes, amid a table full of glass, silver, fruit and dead game. These days we remember most and Vermeer and Rembrandt of course, also van Hals, van Steen and, I hope, Gabriele Metsu. Rembrandt in particular, was an individualist if ever there was one, a history painter who took on big Biblical subjects. But most Dutch painters- hundreds of them- were highly specialized genre artists. That includes van Rusidael. You can see the results for yourself. Virtuosity like this, engendered to a great extent by specialization, was highly prized by the large, sophisticated, middle classes of the time. Dutch Art was a product and consequence of its society and culture, (although not necessarily in the way we might expect.) But before we get into all that, the first, key, vital thing to understand about this society was its sheer money. It is hard to overstate the wealth or technological sophistication of 17th century Holland. Or indeed their long-term influence on the rest of the world, and even on global history. Put baldly then, this is what art from the most successful, highly developed nation on earth looked like. Yet this image may not be what we could reasonably expect from such a culture at that point in its history. More of which anon. But how did the Dutch become so rich in the first place? Many of Holland’s merchant-adventurers amassed extreme, extraordinary wealth, wealth which easily rivaled the greatest landed magnates of Europe. But the Dutch did it through commerce, most notably the highly lucrative spice trade with the Indies. Advances in shipbuilding, accurate navigation and cartography greatly facilitated Dutch trade. But so, crucially, did new forms of banking, share-owning, insurance and finance. The two went hand in hand. In basic terms the import-export trade encouraged the innovation and development of stocks, shares, joint capital ventures, of modern banking and of insurance and reinsurance. Modern Capitalism in other words, was invented by the Dutch. And modern capitalism gave them an extraordinary edge, over both local rulers in the places they traded, and also over rival European trading powers. The material advantages of Dutch Capitalism were graphically spelt out when the Dutch navy trounced the English one, burning most of the English ships at anchor, then just towing away the two best ones for themselves. In the humiliating aftermath and the soul-searching that followed, the English administration concluded their enemies had been able to mobilize, man, equip and supply their fleet in a fraction of the time the English could ever manage. Why? Primarily because of more fluid capital, which in turn of course drew on more supple and more sophisticated financial systems. The English drew the appropriate lessons. Some particularly powerful English did something about it. Something quite dramatic. Just twenty-odd years later, “the Glorious Revolution” saw James II of England toppled by his nephew –the Dutch prince and all round Protestant icon William of Orange. Many of us are brought up to believe that this coup d’etat was primarily a religious affair, triggered by prejudice and by anxiety around Stuart absolutism and of Catholic succession on the throne of England. So it was. Some modern scholars however, also make the important, overlooked point that when William took the crown of England he brought over to London with him Dutch financial systems and know-how. And this was something prized and sought out, by the very Whig oligarchy who’d invited William over in the first place. This combination of material and capital – each prompting and enabling the other of course- created the largest empire of the age and even now, after nearly a century of first relative, then absolute, imperial and industrial decline for the UK, the City of London as a financial capital obstinately remains in obnoxiously robust health. Repulsed by fractal lending and banker bonuses? You can blame the Dutch. So let’s get back to the Dutch. I’m fascinated by what paintings can say or imply about history and societies. But also (of course) by the paintings themselves. So then, enough of the 17th century Dutch money, their ships, stocks, shares and their huge historic influence. What about their Art? We might, initially, imagine the most developed society in 17th century Europe would celebrate that exalted power and status, celebrate it with an Art extolling technical prowess. Or at least extol it in a more general allegorical way, with notions and symbols of Progress. We would be wrong. On the contrary, Dutch artists instead seem to meditate on and to celebrate the traditional, the familiar, the comfortable and the established. They ruminate on virtue, on order and tradition. On the earth and the sky. Do these Dutch painters make art about the glories of wealth and technology? No they do not. Yes of course, there’s an amazing parallel tradition of Dutch Still Life pictures, paintings that celebrates material luxury. Who after all, ever painted silver plate, glass crystal, or the weave of fine tapestry better than the Dutch? But that is just one genre from many. In any case, and on closer inspection, even these Still Lives turn out to be metaphorical ruminations, brooding on mortality, morality, vanity, death and decay. This is an anxious Art then, keenly aware of risk, fate and defeat, of the temporal transient nature of life, of impermanence and mortality. 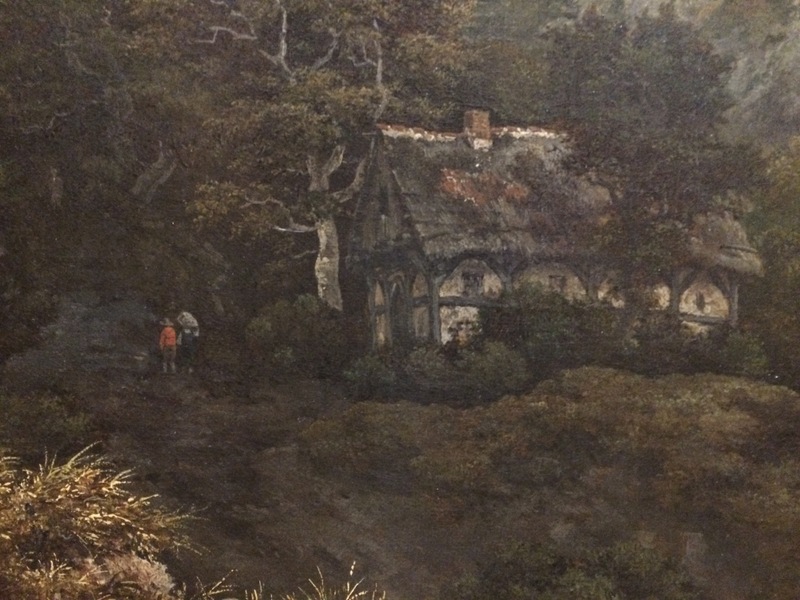 But what of the Dutch landscape tradition? 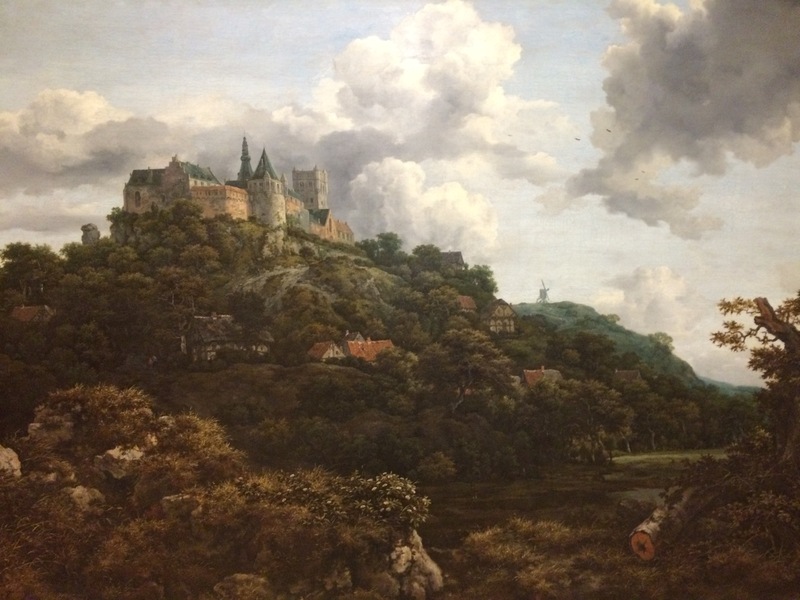 Let’s look again at van Ruisdael’s castle view. He actually made several paintings of the castle. Here’s another, below, painted from a different angle. You have to admire also the structure and mass (and great virtuosity) of the trees and vegetation, and the way those funny, saggy little houses, the way they seem to blend and bleed and disappear into the woods and trees. Many Dutch painters had traveled to Italy, to draw, paint and study. They were greatly influenced by Italian art. Once back home, they influenced their own compatriots in turn. Clues here include the rather un-Dutch, very warm golden light. 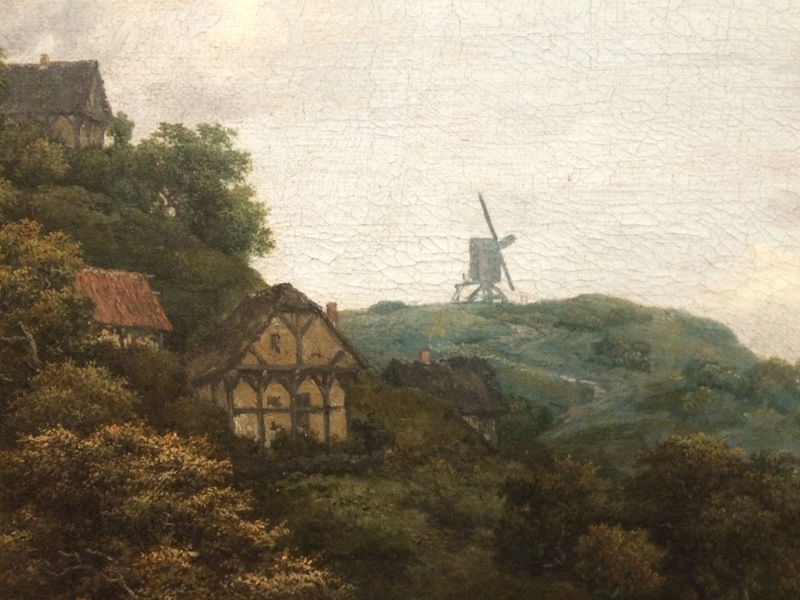 Dutch painters were also influenced by the dramatic rolling Italian landscape, and by the treatment of that landscape by their Italian artistic contemporaries, by that Italian genius for combining drama with a successful and harmonious overall composition. 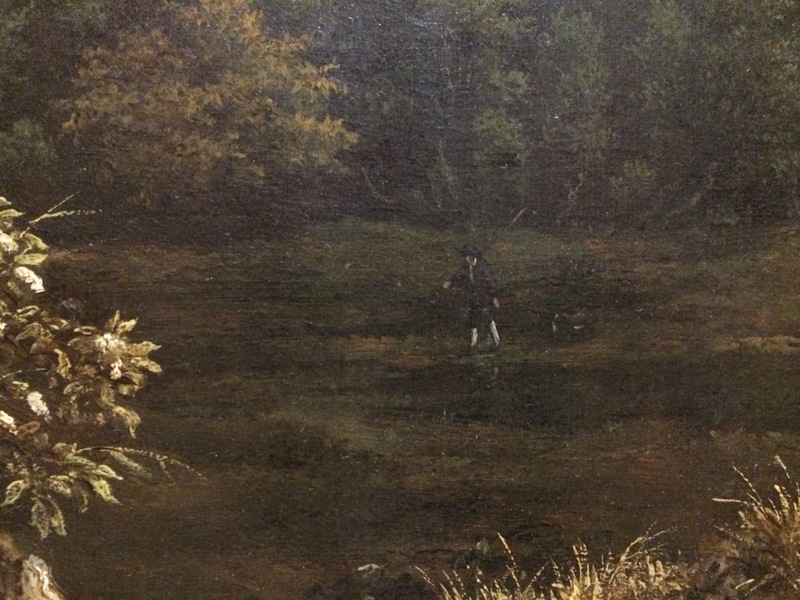 Given how the Dutch lived with a constant awareness of flood and their battle with nature, you can understand the appetite for paintings like the ones above. They seem so dry, so warm and solid. The well known art historian Simon Schama has gone further. He notes that during this period the landscape of the Low Countries was itself undergoing huge change. It was constantly, endlessly, being dammed, drained, reclaimed and reshaped. This, Schama argues, prompted a consciousness, an anxiety and nostalgia about the earth itself. Hence a hunger for images of landscape, perhaps even for images of solidity, of certainty and tradition. It’s surely significant that this picture depicts a castle, the symbol of an older, feudal order. It seems counter-intuitive, no? A Castle, surely, was the antithesis -one would think- of the values of the outward, forward-looking bourgeois Dutch Republic. Anyway, there are no landscapes like this in Holland. That was part of the pictures exoticism and appeal of course. 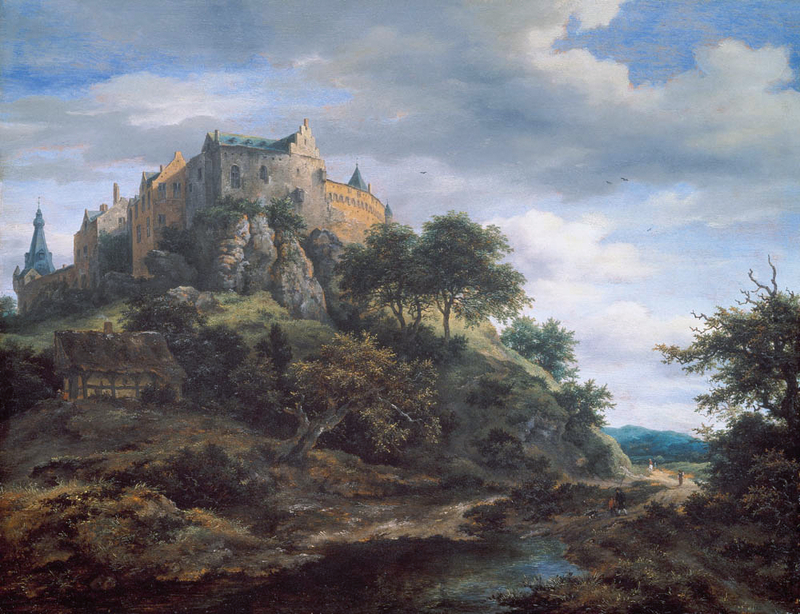 Yet van Ruisdael did not have to travel very far, to paint this castle. Just over the boarder, to neighboring Lower Saxony. The castle is still there today. It is impressive but in real life, in truth, nothing as dramatic as his image. Learning from the Italians no doubt, the Dutchman has artfully exaggerated and (before the either the term or the movement existed) has effectively Romanticized the shape and form of the landscape. 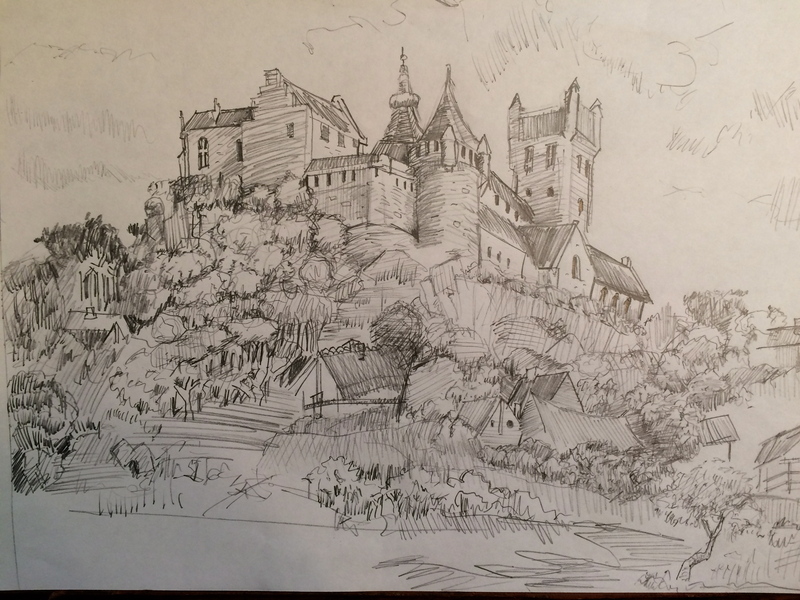 He has exaggerated and distorting the lines and profile of the castle for narrative power, for dramatic effect. Looking at it carefully, it’s almost as though he used a wide-angle fish-eye lens. “Almost”? Perhaps he did just that. Van Ruisdael may have used only his innate knowledge and skill to distort angles of view and exaggerate mass. 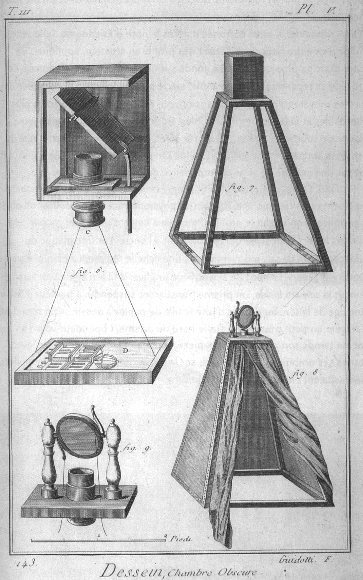 On the other hand it’s not inconceivable that he used some form of optical device to observe or even distort the forms he recorded. Look at the two images again, photo and then painting. What do you think? Yet the accuracy, the “life-like” quality, the sheer verisimilitude of images like this, from both the Dutch Golden Age and indeed from contemporary Italians, is staggering. Think of Canaletto for example, and his extraordinary canal views of Venice. His vedute (as such works were known). Each is packed with vast quantities of highly precise, immensely detailed visual information, all perfectly rendered. How the hell did they all do it? Only people who’ve tried to record large amounts of complex shapes and to locate them convincingly in space know how difficult, how time-consuming it is. Hockney’s wonderful book is in my opinion, the most original input to our understanding of old master paintings of the last 50 years. Yet remarkably, when it should be on the reading list of every student of art history, it’s out of print. This seems bizarre. The book provoked quite a lot of criticism, even hostility. It has has fallen victim, one suspects, to a misunderstanding of its message, namely that his findings somehow diminish the skill or achievement of the artists he discusses. That is a misunderstanding. They do nothing of the sort. Only people who wish to see art as luxury items of status, and some sort of mysterious magic trick, could be so entirely uninterested in their making. I’m sure I’ll write about Hockney’s book again more fully in some future post but lets’ return briefly, finally, to van Ruisdael’s painting. The light and the brushwork is extraordinary. Look at the sky here. Those cream greys. And the way he has treated the mass and volume of the woods, feathery yet solid all at once. 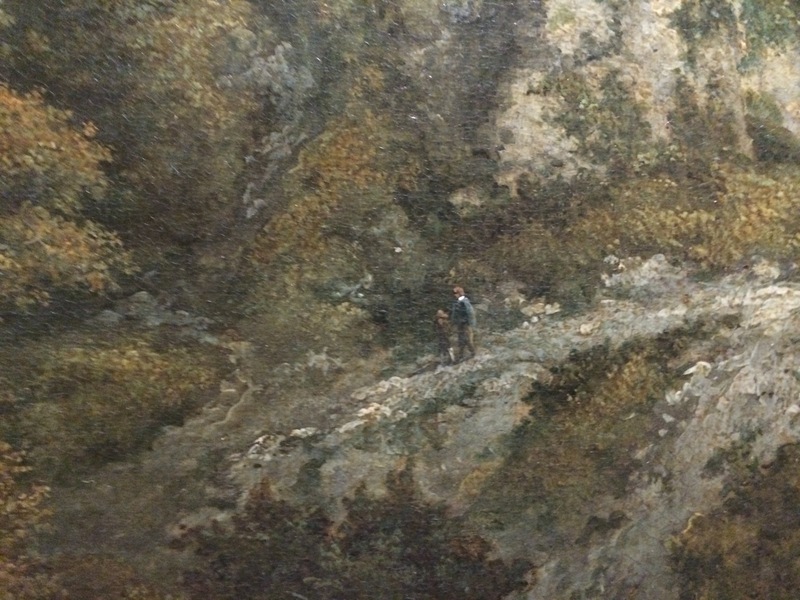 There are even tiny figures, almost hidden in the landscape. Sometimes when I go to the national gallery, if i have the chance, I try drawing the paintings. Partly for pleasure and practice, but also simply to try and understand them better. 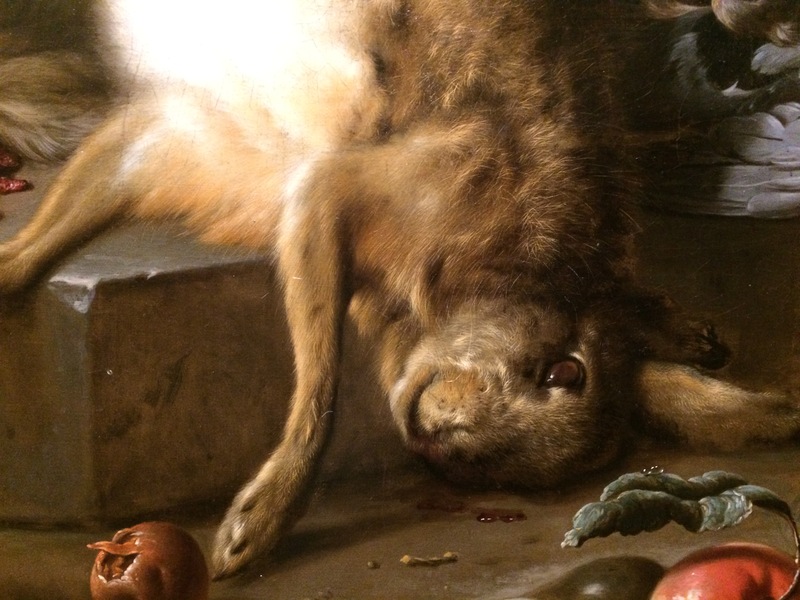 Here’s a picture of a dead hare, from a Dutch still life or game piece work. 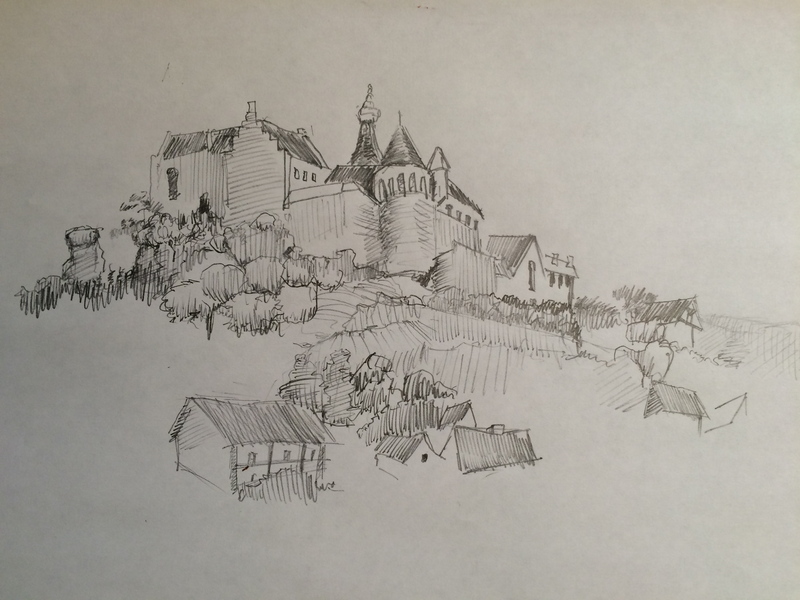 Recently I’ve tried drawing the Castle at Bentheim picture a few times to try and understand it better. Here’s an unfinished version. As you can see I didn’t have time to get in the old square stone tower this time! 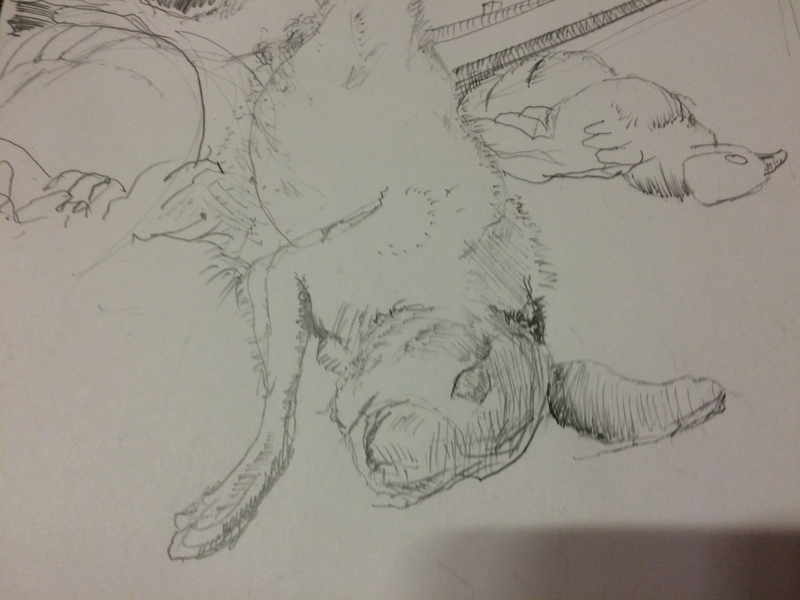 here’s a detail from the same drawing. I was reasonably happy with these houses, with net saggy organic nature of them But in fact they are all out of place. It’s all bloody difficult, which is of course a reflection of my abilities and says nothing (of course) at all about the use or otherwise of optical aids in the original work. 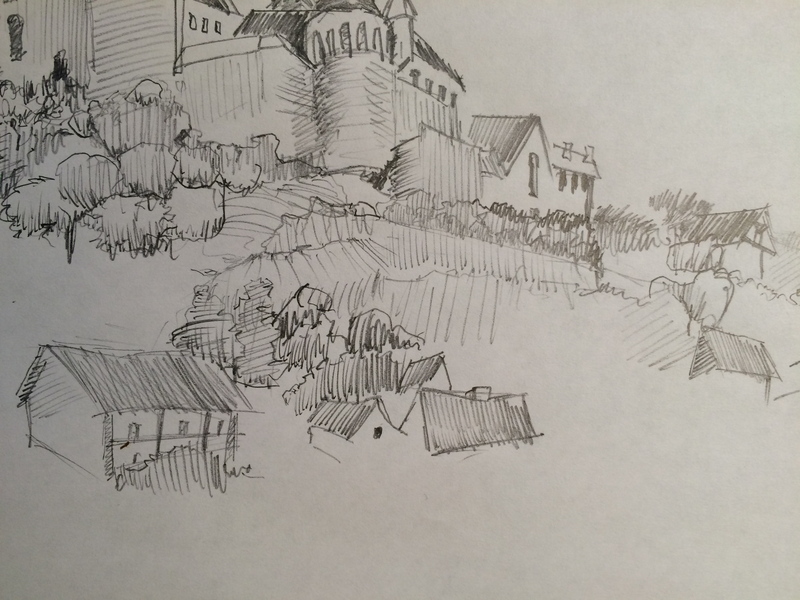 But drawing still brings insights. And not only through observation. Sometimes insight comes in generous and unexpected ways. Recently during one of my drawing sessions, one of the gallery staff approached. He made some kind remark about my efforts and we started discussing the painting. He’d spent a great deal of time with it in the course of his work and like me, he loved it. He asked me how many figures had I spotted. I answered 5 to date. He then pointed out 4 more! Each is minute, done with (literally) one single hair of a sable brush, so tiny as to be almost imperceptible. 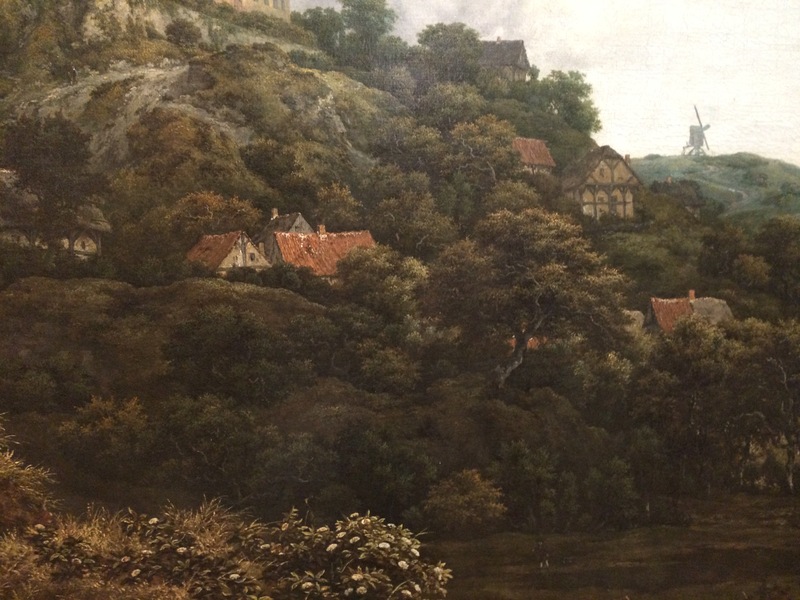 It was another insight into the genius of van Ruisdael, and the genius of Dutch art. It was a lesson in looking. Thank you for reading, and feel free to leave a comment. It’s always great to hear from readers. Arran Henderson leads workshops at the National Gallery, by request for pre-booked groups, usually on weekday afternoons or later on Thursday evenings. If you wish to contact us in connection with one of these private or custom tours, details, rates and how to best contact us are all on the “tours” page. Or if you’d like instead to attend one of our public, scheduled tours, which are very sociable and naturally far more economical, then please subscribe to our free monthly mailing list here. Works referenced above and/or used as sources primarily: “The Embarrassment of Riches, Dutch Culture in the Golden Age” – Simon Schama, and “Secret Knowledge, Rediscovering the lost techniques of the old masters” David Hockney. Further background, and basic date/fact/spell- checking: Wikipedia, and EH Gombrich the Story of Art. January 9, 2015 September 12, 2017 Arran HendersonArt History, Arts and Artists, Book Reviews, Books, Dublin Fine Art Tour17th Century Dutch Art, Art and Artists, Art History, National Gallery of Ireland. Thank you for the comment Anne Marie, delighted you enjoyed the piece, (and the drawings). 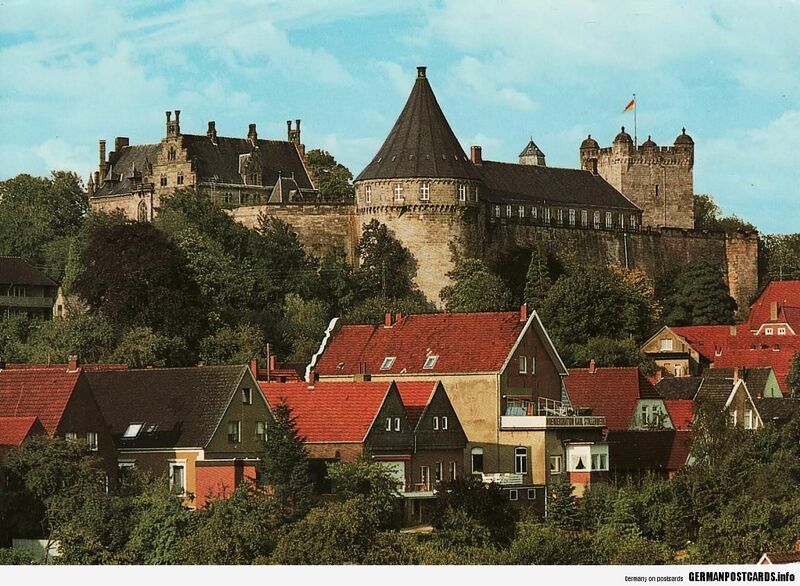 The castle is in a place in Lower Saxony know as Bad Bentheim. Very near Dutch-German boarder apparently. I’d never heard of it either, I suspect it’s not very big! H Robin, many thanks for your comments, delighted you enjoyed. It is certainly Simon Schama who makes that point, and of course the logical place for m him to have made it was (in) “Embarrassment of Riches”. I haven’t made a note of the chapter, still less a page number or anything of that sort I’m afraid. So it is just a matter of schelping through the book, alas. Why do you ask? Does it matter? If you’re preparing some work yourself in this line (?) I might have another rummage, but time too tight for that if its just a general inquiry i’m afraid. I’m still fairly confident it’s in Embarrassment you will find this idea. It’s certainly Schama’s notion. Bear in mind, I am paraphrasing the great man. But the idea’s his, not mine, alas! The only other thing I can think of is that he said it in one of his long form FT pieces, then I later (mis)attributed it) to his Embarrassment book. If that’s so, then it could conceivably have been in his FT piece, a year or 2 back, about the re-opening of the RijksMuseum. But I still think its in his book. Just makes more sense to me. Anyway, am very sorry I can not be more specific, or more help! Good luck with it. Next Post What is satire for?